Have you heard about this cool game called Minecraft? It’s made of blocks! Kidding. It’s abundantly clear that anyone with the faintest interest in video games is surely well aware of Mojang’s lo-fi smash hit. Google Play claims between 5-10 million downloads of Minecraft: Pocket Edition ($7), which had sold more than 54 million copies across all platforms. Let that sink in: fifty-four million. There's a good chance you've already bought Minecraft on Android, but it may have been ages since you last played—the game launched in 2011 in a pretty meager state. So why cover it now? Because Pocket Edition may be the ultimate example of a mobile game worth investing in for the long haul, as the premium sandbox game has been majorly enhanced over that span. And this week’s version 0.10.0 update offers as great an opportunity as any to jump back in—or start fresh. Enemies appear at night in Survival mode and are incredibly persistent. Luckily, the rising sun sets them ablaze. If you’ve somehow missed out on the Minecraft phenomenon, it’s a very simple indie game that lets you collect an array of materials in a randomly-generated block-based world, concoct tools and items, and build freeform structures. You can also try to survive the night in an unforgiving environment filled with aggressive monsters, or connect to online servers and construct cooperatively with others. Pocket Edition isn’t a complete port of the PC original, but the Android version has evolved tremendously from its skimpy 2011 debut. It began as a proof of concept, to show that Minecraft could work on mobile, but now it’s a truly robust, engaging experience that rivals the bigger versions in allure. Version 0.9.0, launched in July, was the biggest update by far, bringing infinite worlds, generated structures like caves and villages, and a huge array of new blocks and environment types. All of that added some much-needed variety and personality to the experience. By contrast, this week’s Version 0.10.0 update is all about polish. After expanding the world, the latest free enhancement focuses on improving performance across all devices (while adding 64-bit support), slaying lingering bugs, and lightly enhancing the graphics. In Mojang’s own words, that means “more watery-looking water,” along with things like tinted lighting and particle effects. 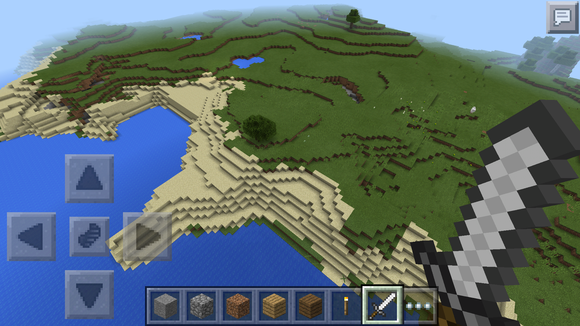 Small tweaks, sure, but the end result is the best-running Minecraft you’ve ever seen on a smartphone. 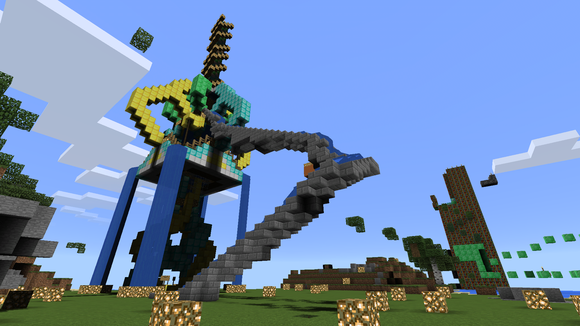 Creative mode lets you chuck the shackles of gravity at any moment to soar through the sky. While that allows you to build structures more freely (especially with the infinite inventory of items), it also provides an opportunity to catch a great view. One of the best parts of going online—search Google to find loads of free public servers to join—is seeing the elaborate structures that others have poured hours into. This one’s pretty tame compared to some of the others out there! It’s important to get to know the wildlife around you. Not just for companionship in this cold, quiet world, but because you’ll inevitably need to bash them into parts—like meat and wool—at some point. It’s a sad fate for a block buddy. 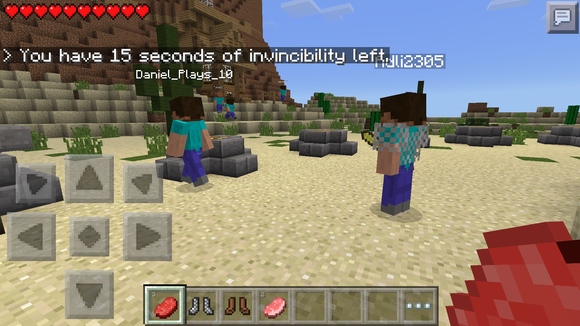 Minecraft has an online deathmatch mode? 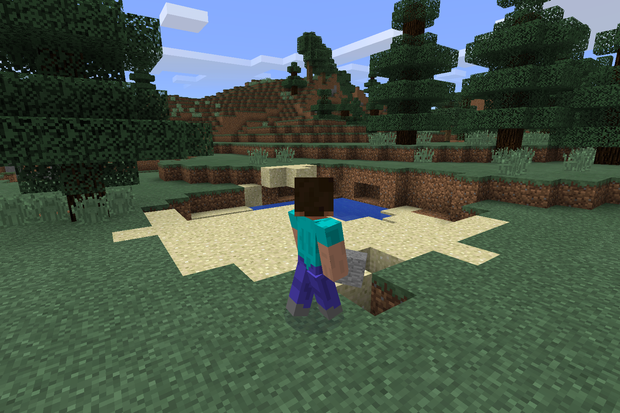 Believe it: fans have used the sandbox setting to create their own game modes. Here, you’ll make a mad dash to treasure chests to quickly secure items, and then use those to bludgeon others. Had Mojang left Minecraft: Pocket Edition in its original state, it still probably would have sold millions. It is Minecraft, after all. But that $7 investment has been rewarded time and again with a routinely improved and ever more valuable game experience. Sometimes it’s a big content addition, while other times it’s a push towards improved performance and making sure it runs great on your latest device. Either way, Pocket Edition keeps growing, but you don’t have to pay another cent. Having a game of this depth and replayability with you at any given time is a wondrous thing, and with multiple modes, online play, and plenty of surprises to uncover in each new world, there’s reason to keep coming back. Microsoft’s acquisition of the franchise this fall hasn’t stopped forward progress, as evidenced by the new 0.10.0 update and more on the way. It’s rare piece of mind to know that you can spend a little extra for a great mobile game that will only get better and better. 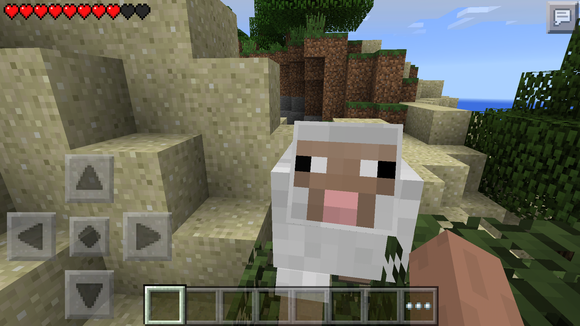 That’s why Minecraft: Pocket Edition is a game well worth paying for.